Whispers in the Loggia: Six Weeks 'Til Christmas; Two Takes On "A Rose"
Six Weeks 'Til Christmas; Two Takes On "A Rose"
Hard as it is to believe, church, as The Pope Himself noted at this morning's Angelus, we find ourselves at the "penultimate Sunday" of the liturgical calendar. Next week brings Christ the King; the Sunday after, New Year's (i.e. Advent)... and already -- at least, in this part of the world -- the 24/7 devotion of the radio stations to full-time "Holiday" playlists has begun in earnest. 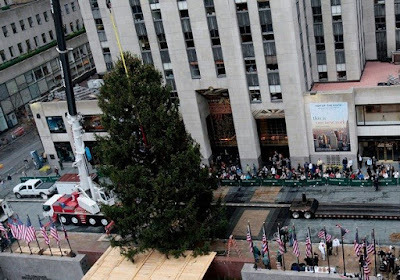 And, indeed, the Rockefeller Center tree is already up and being trimmed in place. Hope no one minds the listening -- in the hope of common reflection, it'll be an added feature over the next six weeks.